Irish Neutrality: Sacred Cow or Pious Wish? Given the current controversy surrounding Irish neutrality and the use of Shannon Airport by American troops we, as Irish citizens, have every right to be concerned about where we stand on the question of neutrality. After all it is a treasured ‘sacred cow’ of the Irish Constitution. Or is it? A look at the record shows that, during World War II, Fianna Fail was not only a ‘slightly constitutional party’ but Ireland was also a slightly neutral country! 'The focal point of the war against England and the one possibility of bringing her to her knees is in attacking sea communications in the Atlantic ' , said Karl Donitz, Grand Admiral, German U-boats. For him, things were looking good. In December 1939, the opening year of World War 2, German submarines operating together with planes and surface raiders, accounted for 754,000 tons of Allied shipping losses. This represented 99.6 per cent of all shipping sunk in 1939. At this point in the war Britain had less than 3 weeks supply of wheat; stocks of many other commodities such as sugar had fallen to under 6 weeks supply. A solution had to be found, and quickly. As Europe fell to the advancing German armies, the UK became more and more isolated and increasingly dependent on the Atlantic trade route for industrial raw materials and food. If this lifeline were broken England would starve both physically and financially. Following the successful conclusion of the 'Battle of Britain' in October 1940 England prepared immediately for what was to become known as the ' Battle of the Atlantic '. Although some air cover was already provided, a 'black gap' existed in mid-Atlantic, a section that could not be reached from existing air bases. Both Germany and Britain realised the importance of this gap. If U-boats could operate in this area without fear of air attack then the allied convoys would be at the mercy of the German 'wolf packs'. As a result of aerial surveys carried out late in 1940 and despite a less than favourable report, construction of an RAF base began almost immediately on the old Castle Archdale estate on the shores of Lough Erne with the intention of closing the gap. There was one snag. The extra 100 miles range possible from the new base would only become a reality if the aircraft could fly due west over neutral Ireland . Failing an agreement, planes would have to fly north over Lough Foyle before heading around Donegal’s northern shore for the Atlantic battleground. Britain was determined that despite De Valera's dogged insistence on neutrality they would bring 'the ungrateful Irish to heel'. The bombing of Belfast by the Luftwaffe in April 1941 in which 750 people were killed was a signal lesson to the Irish government then (and today!) of what might happen should they join the belligerents. In May, German planes bombed Dublin killing 34 people and destroying 300 houses in the North Strand . Churchill was to admit later that this may have been as a result of the distortion of Luftwaffe radio guidance beams by the British in an attempt to bring Ireland into the war . While De Valera would not be coerced into joining the war, pragmatism demanded that, despite strained Anglo-Irish relations, an official blind eye be turned to what became known as the 'Donegal corridor', a route over south Donegal/north Leitrim/north Sligo , which led to the Atlantic . This concession was subject to the condition that flights be made at a good height and that the route over the military camp at Finner be avoided, both of which conditions subsequently received scant attention from the British. The 'nod and a wink' policy of 'neutral Ireland ' quickly extended to more than just a shortcut to the Atlantic ! As the bombs rained down on Belfast on the night of 15-16 April 1941 a panic-stricken call from the Six County Security Minister, John Mc Dermott, brought a humanitarian dash by thirteen units of the Dublin Fire Brigade to the rescue of the devastated city. Other concessions followed. The establishment in June 1941 of an armed air/sea rescue trawler, the 'Robert Hastie', manned by eleven British personnel, at Killybegs fishing port was shrouded in secrecy. 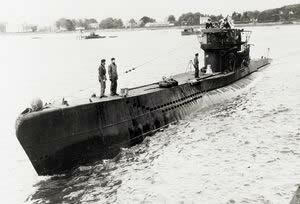 Its purpose was to provide assistance to shipping casualties and to supply planes that had run out of fuel. The need for such a vessel was clearly illustrated the previous April when Pilot Officer Denis Briggs, returning from a routine U-boat patrol, was forced to ditch his Saro Lerwick sea-plane in the sea off Tullan Strand, Co. Donegal when he ran short of fuel. Watching the descent of the stricken plane Irish army observation posts shortly afterwards beheld the unusual sight of an airplane being towed to Bundoran by a passing fishing boat and immediately reported the incident to HQ. This was a new dilemma for all involved. Local units of the Army, unaware of decisions made at higher levels, proceeded on the assumption that the crew would be interned for the duration of the war in neutral Ireland and the plane impounded. Following some hasty consultation and diplomatic manoeuvring a camouflaged air force lorry arrived from across the border in Castle Archdale with eighty gallons of aviation fuel. The plane was made ready and took off with its crew for their home base on Lough Erne. Co-operation between the British and Irish authorities was soon commonplace, eventually becoming so close that in some instances HQ in Athlone could inform Castle Archdale of downed planes in Irish territory before the British even knew they were missing! There were approximately 1,000 wartime crashes and forced landings in the Six Counties and 162 in southern Ireland during the war years. One of the first crashes, in March 1941, was a Catalina Flying Boat from 240 Squadron, Castle Archdale. Crashing into the mountain near Glenade, Co. Leitrim, nine bodies were later recovered from wreckage that was strewn all over the mountainside. There were no survivors. In December 1943 a Flying Fortress B-24 bomber crashed into the side of Truskmore Mtn. in nearby Ballintrillick, Co. Sligo . Three men died on impact. Locals and the L.D.F carried seven injured survivors down the mountain to safety. On the evening of December 5 th 1942 people from all over North Sligo looked up into a lowering winter sky, watching fearfully as a huge Flying Fortress circled noisily overhead looking for a safe place to land. 'The Devil Himself' created a sensation when it dropped safely out of the sky on to Mullaghmore beach. The crew of American officers and airmen were feted in accommodation at the Beach Hotel, Mullaghmore and at Finner camp for 17 days while a replacement engine was supplied from Northern Ireland and fitted to the plane. An enterprising local man did well when he received two pounds compensation from the Irish Air Corps for damage to land he claimed was his but was actually a commonage! In February 1945 Privates Herrity and Gilmartin watched from their L.O.P. on Mullaghmore Head as a British Halifax four engine bomber, carrying a Canadian and British crew, circled looking for a suitable landing place. They contacted Killybegs lifeboat station when the plane fell like a stone into the sea one mile East of their position. 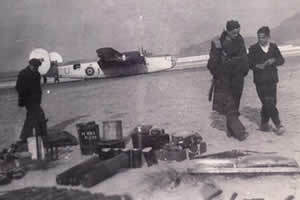 Locals watched helplessly from the shore as the men clambered from the cockpit onto the wing as the plane sank under them. Two men drowned and four were saved. The struggle was a desperate one but eventually, thanks to Ireland ’s part in the Battle of the Atlantic , Germany ’s stranglehold on British shipping was broken. Is our present stance on neutrality still just a bluster and a pose? By our co-operation at Shannon are we leaving ourselves open to attacks by Arab terrorists? Escaping with a ‘slightly neutral’ stance in the past is no guarantee of safe passage with such a policy in the future! 'Robert Fisk: German U-boats refuelled in Ireland? Surely not! …A reader has sent me a fascinating account of his dad's war service as an SOE recruit. He was an expert in bomb disposal, demolition and sabotage, trained at Brickendonbury Manor, near Hertford, with the rank of lieutenant and later attached to the Royal Navy in Derry – or Londonderry, as all good Protestants and Brits would at the time have called the last of our Irish Treaty Ports. The other three had been cheerfully handed over to de Valera by Malcolm MacDonald in 1938, earning Churchill's most poisonous hatred. In 1940, our man – his reader-son asks for anonymity – was sent to a base unit at HMS Ferret in Derry with five members of 30 Commando, Royal Marines; their job was to "prepare and supply equipment" (incendiary and explosive charges) for 15 marines and two officers aboard the "Royal Fleet Auxiliary Tugboat Tamara which was disguised as a trawler". Ho ho, cried Inspector Fisk when he caught sight of these words in our reader's letter. For the Tamara had appeared in my Trinity College thesis. It was commanded by Lieutenant Commander W R "Tiny" Fell who went on to design midget submarines and who had spent – according to my own research – a fruitless few weeks searching for German U-boats off the west coast of Ireland, or Eire as it was then known. Our reader's dad, however, believed that the Tamara was on no wild goose chase. "Father regularly, as did many British servicemen, changed into civvies and nipped across the Eire border for a crafty drink. He usually went to the village of Dunfanaghy. Favourite haunts were... Molly's Bar, Arnolds Hotel and McGilloway's." All still exist. Molly's Bar even has a Facebook page which boasts of its "craic" and McGilloway's is famous for oysters. Now, at least. But then? Our reader's dad "told me that one of the Irish landlords insisted he did not go into the snug since 'other gentlemen officers' were already there. He sneaked a look and discovered these were U-boat officers, whose craft were laying up in remote inlets on the coast, come ashore for unofficial R and R, and wearing their uniforms because Ireland was neutral." sightings in 1939 west of the Blasket Islands and near Bundoran, County Donegal. And they also state that, although "there was... no evidence proving the existence of refuelling bases, there was evidence that U-boats were... quite possibly... landing crews for purposes of relaxation and obtaining fresh provisions." Other reports of U-boat landings – except one in Bantry Bay "from a reliable [sic] source" – could "neither be accepted, nor wholly discounted". Guy Liddell, the director of wartime British counter-espionage, wrote that he had asked Colonel Liam Archer of Ireland's G2 military intelligence about U-boat landings, to which the alleged reply was: "They are here in force, we can't do anything." According to Liddell, Archer said that a U-boat called in three times a week at a base at the mouth of the Doonbeg river, County Clare. Archer, who was a senior liaison officer at a secret meeting with the British, is on record as telling them that some Irish ports did not even have permanent military guards (but not as admitting that U-boat packs were flocking to Irish coastal waters). Archer also gave British intelligence details of equipment, found on three captured German agents in Skibbereen, which included explosives inside a tin of French peas intended to blow up Buckingham Palace. Archer would not let the Brits interview the three German prisoners. I can well see why. For before this glorious secret history takes hold of your imagination, there are one or two snags. Quite apart from the British Cabinet's lack of evidence, our reader's father suggested that the fuel storage tanks in the Republic might in fact be part of a smuggling racket between Eire and Northern Ireland (which, by the way, still continues). And our reader himself admits that "many of the suppositions about German forces in the Irish Republic may be down to the very German-looking uniforms used by the Irish at the time but which were changed in the 1940s". All of which is correct. Norwegian Allied troops also used German-style helmets in 1940 – often prompting patriotic Englishmen to arrest them. In 1979, not long before he died, Frank Aiken, IRA veteran and wartime minister of "coordination for defensive measures" told me that "no German U-boat landed on the Irish coast – if it had done, I think I would have heard about it." 'Joe, I have just read your web page about Ireland's neutrality during WW11. I was particularly interested about the R.A.F flying boat being towed into Bundoran. My father Francis Daly and his brother William were the Bundoran fishermen who towed the plane to safety. They were paid ten shillings for their efforts. My father also told me that on another occasion he brought a dead soldier or airman into the boat quay.